Atomic Salts nic salts e liquid. Made by Nicopure, the manufacturer of Halo and eVo. - lot coding, & and best-by dates. Use with a refillable pod-system. Atomic Salts There are 6 products. Cherry Bubblegum | Atomic Salts Sweet Savoury Cherry Bubblegum nic salts are made by Nicopure Labs to the absolute highest quality. Fast nicotine delivery, longer-lasting nicotine effect, and more discreet vaping. Use only with low-wattage vaping pod systems. 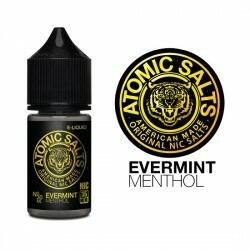 Evermint Menthol | Atomic Salts Mint Menthol It’s menthol flavour that just won’t stop. Evermint Menthol overwhelms you with an indescribable soothing sensation. Use only with vaping pod systems. Lemon Freeze | Atomic Salts Lemon on Ice It’ll make your lips curl, and you’ll love every second of it. Lemon Freeze is an icy spin on your favourite tart fruit taste. Use only with vaping pod systems. Mango Mint | Atomic Salts Mint & Mango When fruit meets mint, anything can happen, and usually does. Mango Mint merges mild sweetness with minty coolness. Use only with vaping pod systems. Vanilla Custard | Atomic Salts Sweet Dessert Cream It’ll make you melt, but you’ll ask for more. Vanilla Custard turns creamy dessert sweetness into an incredibly satisfying salt. Use only with low-wattage vaping pod systems.